In a nutshell a CFD (Contract For Difference) is an unlisted instrument that is an agreement between a buyer and a seller to exchange the difference in value of a particular underlying asset (like a share) for the period between when the contract is opened and when it is closed. The difference in value is determined by reference to the underlying asset. CFDs are unlisted and counterparty risk is not guaranteed by an exchange. It is therefore very important that you deal with a big financial institution like Sanlam that will not go bankrupt. Your counterparty will be Sanlam Private Wealth, part of the Sanlam Group. 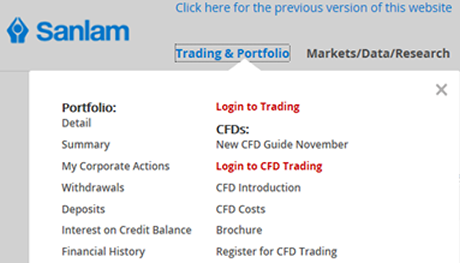 CFD Costs interest charges, broking fees, etc. Leverage/Gearing: CFD instruments allow the client full exposure to the underlying share with less capital layout. It requires a small amount of capital layout called the initial margin. At 15% margin, gearing is nearly seven times. 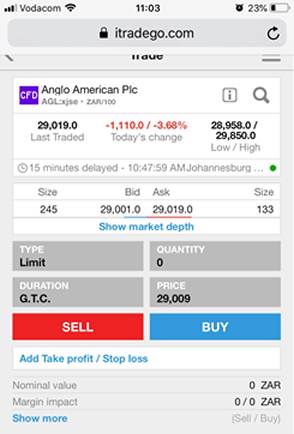 Open short positions: CFD’S allow the trader to go short the market when it feels the share price is going to fall in future. This allows the trader profit when market goes up as well as when the market falls. Pairs trading: ‘Pairs of stock" is a method used if the trader feels the one stock will outperform the other. The trader may feel Anglos will outperform Billiton and thus buy Anglos and sell Billiton short. At the outset it should be noted that trading in CFDs is more risky than direct share trading and should only be attempted by individuals who are already familiar with the share market and are comfortable with the concept of gearing. Gearing can increase profits, but it can also increase losses. Stop-loss techniques and predetermined exit strategies are an integral part of CFD trading and should be studied before trading as they can assist in limiting losses in volatile market conditions. It is important to note that the liability for a holder of either a long or short CFD position is not limited to the initial margin deposited. If the market moves against a position then the holder of that position may be called upon to pay additional funds on short notice to maintain the position. You will also be automatically closed out if your margin falls below certain thresholds. No app needed because the platform is designed in HTML5. You can access it from any device. Get a free CFD Demo account to try it out for 6 months. Register here. Click on the link below for our fully digital online registration process.